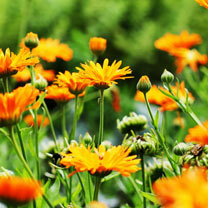 The original 'Pot Marigold' with single orange flowers which can be used to add colouring to rice or in salads. Flowers June-July. Height 45cm (18"). They’re produced without the use of synthetic fertilisers and pesticides. Organically certified seeds have been raised in a way that is better for our soil and environment. They’re perfect for insects and pollinators.